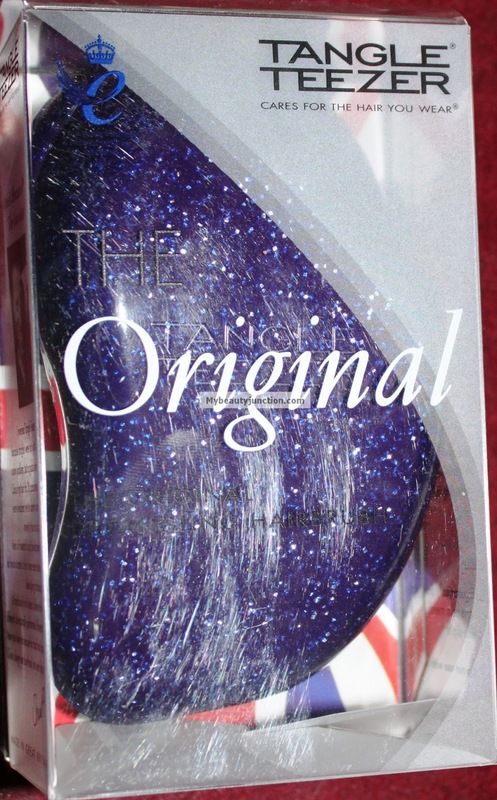 The Original Tangle Teezer has been making waves across hairdressers and homes alike for some time now. I had been trying for ages to find out what the fuss was all about, but my orders kept getting lost in the post. I finally got one delivered safely last month. This Tangle Teezer is in the shade Cosmic Purple. It is a gorgeous colour with shimmer. It is just a little larger than my palm (I have small hands) and is curved to fit snugly. You already know about Shaun P. and the salons, so I'll not talk about all that here. As you can see, the trick lies in the placement of differently-sized bristles. They are flexible and will not tear your hair, but pass through it, when they encounter a tangle. I already use and own two Tangle Tamers from Denman, so I'll do a (purely subjective) compare and contrast. 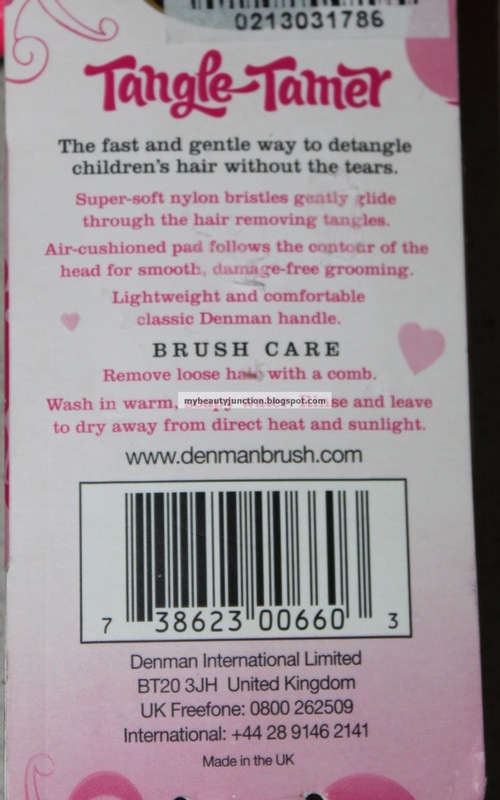 You can read my detailed review of the Denman Tangle Tamer here. The Tangle Teezer can be used wet. 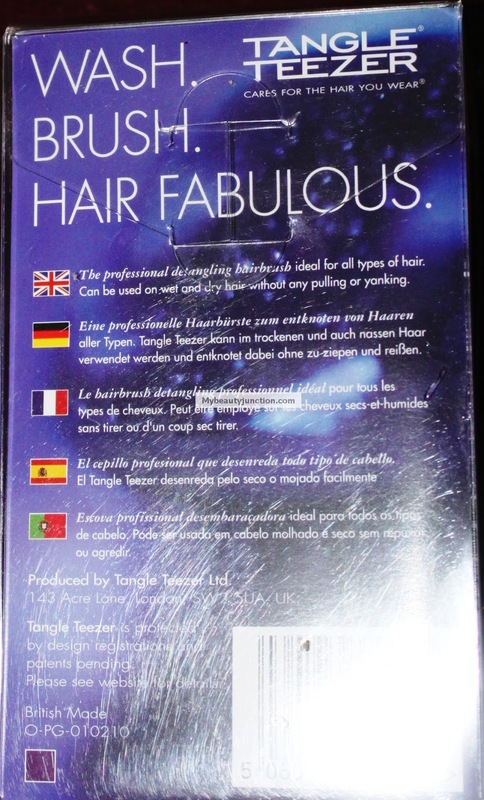 So can the Tangle Tamer, but the latter gives silkier results on dry hair. The Tangle Teezer does not have a handle. I prefer my brush to have a handle, like the Tangle Tamer does. The Tangle Teezer doesn't get that dusty. The Tangle Tamer is a dust magnet. The Tangle Teezer's bristles are less soft and flexible compared to the Tangle Tamer - the Tamer is therefore kinder on knotted hair. The surface area of the Tangle Teezer is larger. 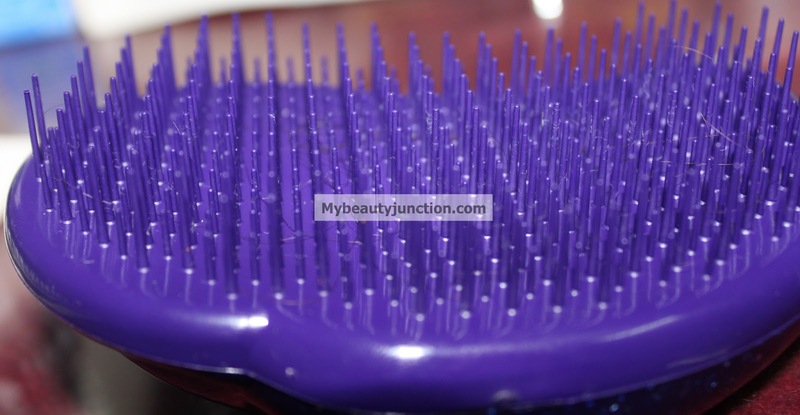 My theory is that, if you have fine hair, go for the Tamer because its bristles are more flexible. 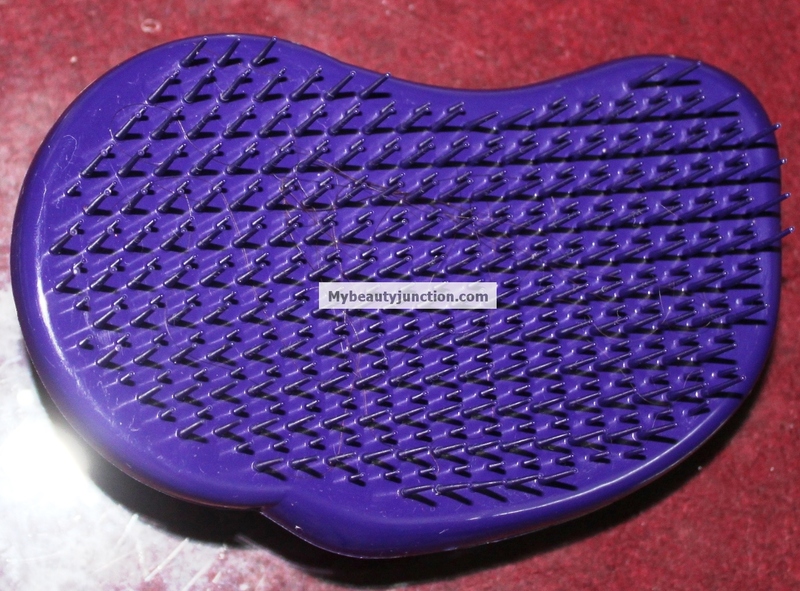 The sturdier bristles make the Tangle Teezer good for travelling. And easier to clean. The Tangle Tamer's bristles seem more fragile and you need to be careful while cleaning. Both come in different colours and designs. My Teezer is Cosmic Purple while Tamer is a hot pink. Blow-drying with both works okay. I use a Head-Jog detangler to blow dry, but more on that another time. Both are made in the UK. Both are equally gentle on your scalp. You can drop both on the floor, nothing happens to either brush or floor. I've tried. Which do you need, if you have normal/frizzy/wavy/curly/straight-ish hair, the Tangle Teezer or the Tangle Tamer? Both. One for daily use and one for travel :) No, that wasn't diplomatic. It is purely my opinion. I use both. It depends on hair-type and comfort preferences. And I paid for both myself; no PR, freebie or bribe. The Tangle Tamer is available in most department stores/malls. 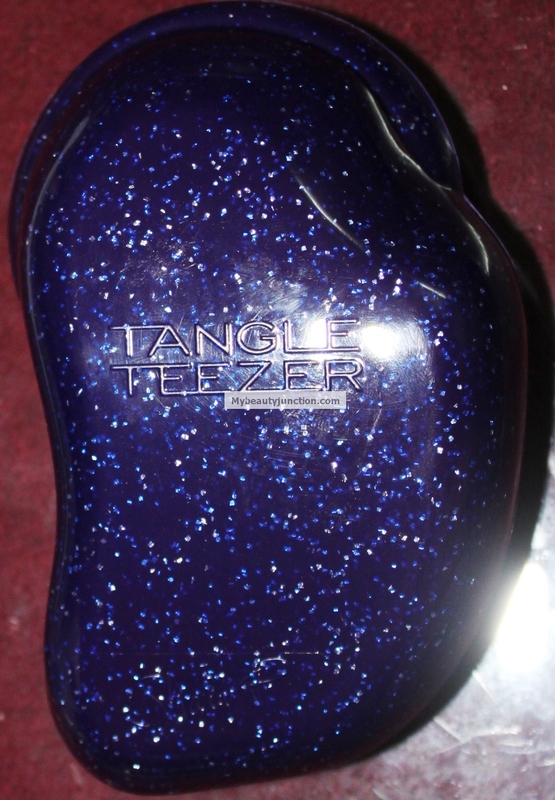 You can get the Tangle Teezer from several websites that ship internationally.